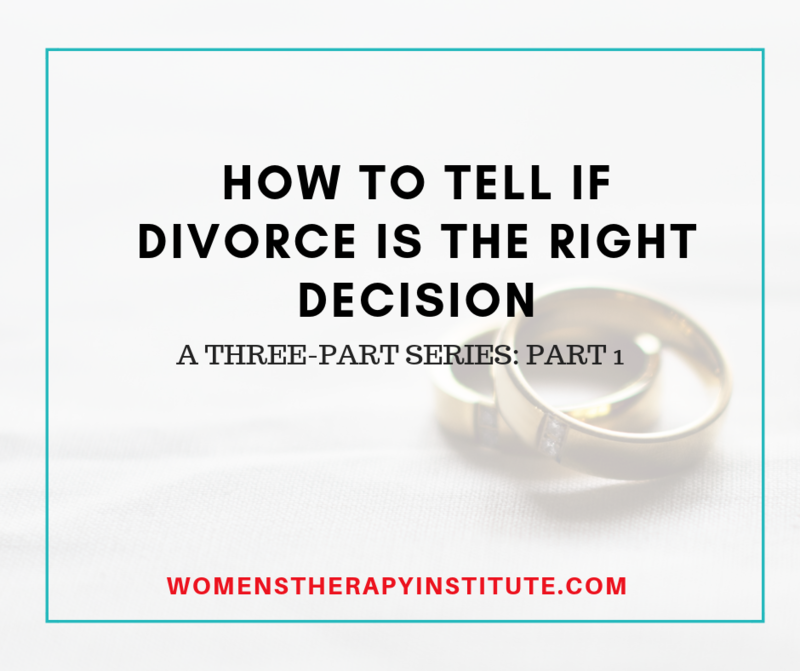 This is part one of a three-part series on how to determine if divorce is the right decision for you as a couple. 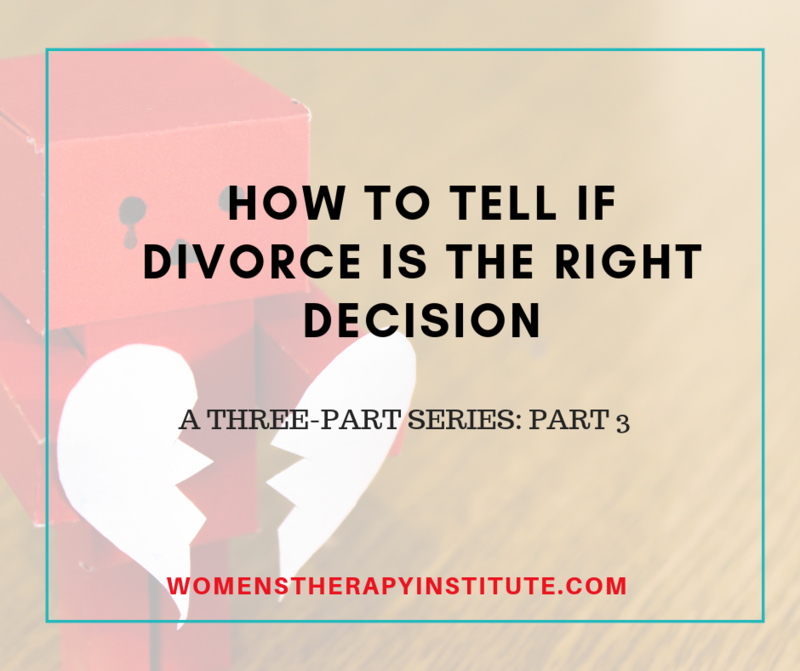 This series will dive deeper into the options couples who are thinking of divorce have and the factors they should consider. Making the decision to get divorced can be one of the most difficult decisions a couple can make. There are a lot of factors that play a role and there are many details to consider. Nobody wants their marriage to end in divorce but it is, unfortunately, a common reality these days. If you and your spouse are considering divorce — how do you know if it’s the right path for you? When seeing a couple who is considering divorce it is important for us, as counselors, to help not just one partner but both to explore three options. The process is called discernment counseling. Developed by Dr. Bill Doherty, discernment counseling focuses solely on helping couples to decide what they want to do with their relationship. It is unlike traditional marriage counseling, which is designed to save a marriage (but doesn’t work unless both partners are fully on board). Generally, discernment counseling is brief with the goal of getting couples unstuck so they can move forward in whichever direction they have determined to be best for them. The first option for a couple to consider is to do nothing. Doing nothing is exactly how it sounds. It means everything stays put. Couples that choose to do nothing will not seek any additional counseling. They simply will keep things as is in hopes that whatever bumps their marriage is facing is just a “phase” that may eventually pass. A couple who chooses to do nothing may not be ready to make the decision of whether or not to get divorced. Maybe they have kids and they are just not ready to put them through that process, or maybe they are holding out hope that things will get better. Whatever their reasoning chances are they may return to discernment counseling at a later date, or decide down the road to seek marriage counseling. I frequently hear from women that they deny their emotions, they want to hide emotion to not be seen as “sensitive” or “emotional.” They tell me it hinders them at work, and it causes them to have an image of being “weak.” That stereotype is wrong. The pre-conceived idea that we shouldn’t be letting our emotions play a role is fundamentally not true, and research proves it. Neuroscience professor Antonio Damasio has found in his research that without emotion people are unable to make good decisions. He studied patients with brain lesions whose ability to feel emotion was impaired but their reason was otherwise unaffected and found those people could not make good decisions. He found that the “extended” self-conception of humans emerges from emotions and feelings. 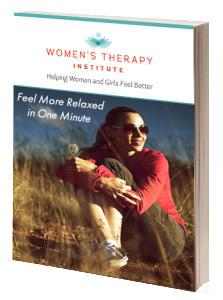 In his research, Damasio determined there is an “action program” in the body that starts with an emotion. 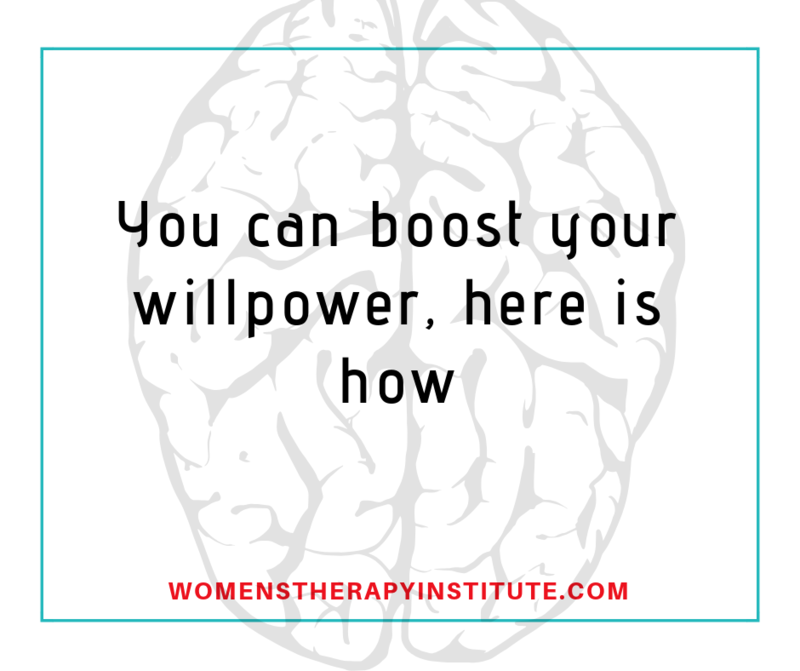 When we feel fear, for example, our body takes the feeling and uses it to develop a proper mental reaction that will ultimately lead to an action. 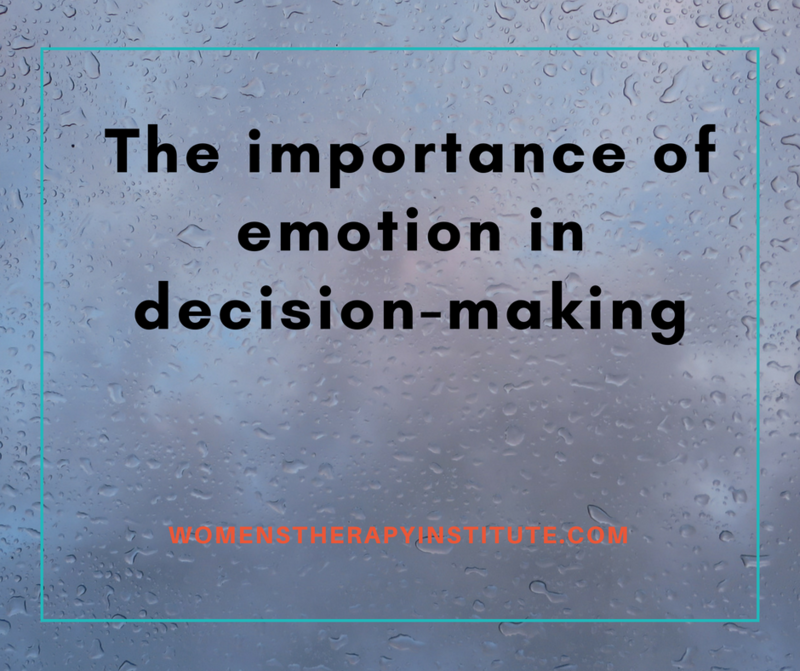 Our emotions are what help to guide us in decision-making. They help us determine the next step. Emotion is so critical to us as humans and the way we function that we wouldn’t have music, art, religion, science, technology, economics, politics, justice, or moral philosophy without the existence of strong feelings. So next time you think about denying your feelings, think again. You are feeling the way you are for a reason and the mere presence of that emotion is important. It is essential to your daily life and function. It is helping to guide you to make good decisions. Emotion is not a sign of weakness. If anything it is a sign of strength. Your body is doing exactly what it is supposed to be doing. You are human. Most people have made a pivotal decision in their life where they feel they have failed. The human brain tends to be more sensitive to the negatives and failures. That is why we ruminate on the bad and don’t trust ourselves. We keep a mental inventory of all the bad decisions we have made making it more difficult to trust we are making the right decisions going forward. Studies done by psychologist Dr. John Cacioppo prove the brain reacts stronger to negative stimuli than positive. Cacioppo showed people pictures that generally produce positive feelings, for example tasty food or a luxury car. Then he showed them pictures of things that usually stir up negative feelings, such as an injured person or animal, followed by pictures of items that produce neutral feelings, like a plate or hair dryer. As the pictures were shown he recorded electrical activity in the brain and found that the brain reacted stronger to the negative stimuli, showing that our attitudes are more heavily influenced by the negative. For more on this research see: https://www.psychologytoday.com/us/articles/200306/our-brains-negative-bias . We have all made positive decisions. We have made decisions that have left us feeling satisfied, try to focus on those. You can drive yourself crazy always wondering how things would have turned out if you took a different path, but what is the use in that. 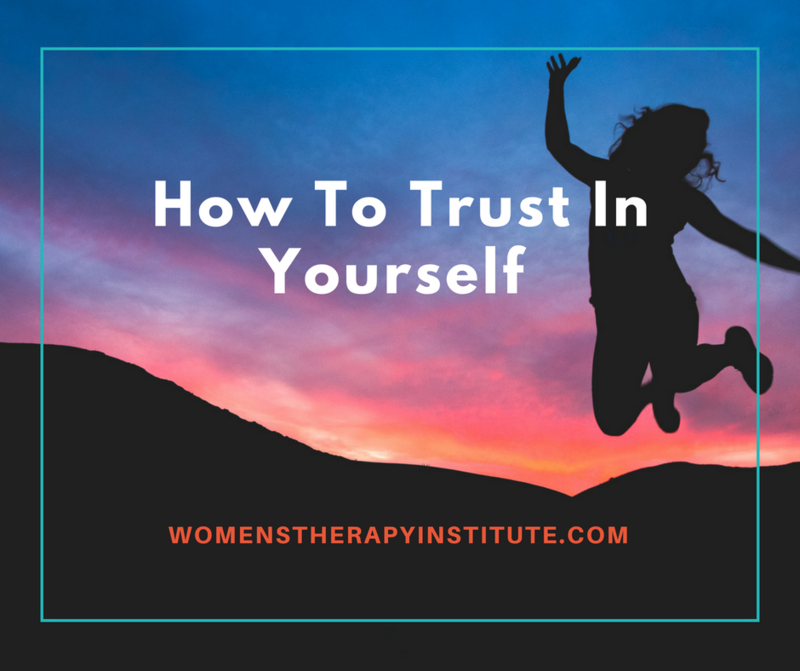 You need to start to trust in yourself, trust that you have done the best you can and made the right choice for you in the moment. 1.) Make a list — pros and cons lists are amazing things when it comes to big decisions. Making them can help you to realize that you are making the best possible choice you can. 2. )Learn from mistakes— we are not perfect. You will make some wrong choices in life, and that is ok. In fact, I would be a little concerned if you never made a wrong choice. Learn from your mistakes and grow from them. Next time it will help you to make a better choice. 4.) Start small — start by making small decisions. Maybe it is as simple as where you are going to take your family for dinner. Or what you are going to order from the menu. As things start to turn out well you will gain confidence and the big decisions will come easier. Work your way up. 5.) Focus on the now — let go of the things that did not go as planned. Think about the things going well in your life now and look directly at the decision at hand. Don’t think about the thousands of scenarios the future holds. Finally, trust yourself. You can achieve more than you ever know. You are stronger and wiser than you believe.